Graham Potter writes a weekly column for the Sunshine Coast daily. Due to demand from those having trouble accessing the paper these columns are now also published on HRO courtesy of the Sunshine Coast daily. The fact that connections have confirmed that Winx will have her last race in the Queen Elizabeth Stakes at Randwick on Saturday has not stopped some of her supporters starting petitions to try to get her to race on … with their wish list even including a trip to Royal Ascot mid-year or a go at a fifth Cox Plate win October. The unsettling prospect of having to cope with life without Winx has also revived some nervous debate about just how good Winx is. Suddenly many racing enthusiasts seem to be out of their comfort zone. 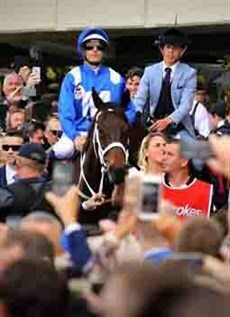 Through all of Winx’s mighty career those same supporters and enthusiasts have marvelled at the horse management expertise of trainer Chris Waller. That is another area in which Winx has always come first. Waller has always said he would only do what was best for Winx and he has never compromised that rule and much praise has been heaped on the trainer for having that outlook and sticking to his guns when other temptations must have beckoned at nearly every turn. So why would anybody want to second guess Waller now? If he thinks it is right to call time on Winx’s career that is good enough for me. As nice as a fifth Cox Plate attempt sounds it would only add to her already supreme local whitewash record … and as far as that often talked about omission on her resume is concerned (having never raced overseas), the reasons for not doing that are the domain of her connections only and no explanation is necessary. That decision has always been entirely their prerogative. They know their horse best and remember Winx’s well-being comes first … before any punters’ wish-list and that omission doesn’t make her any more or less of a racehorse. A champion is a champion. I do have a feeling that, initially at least, Winx is going to miss racing as much as we will miss her presence. She knows she is good and seems to have enjoyed every minute of the adulation. In the unlikely event that there is a late change of heart and Saturday is not Winx’s last race-day, I will support that decision as well. That’s not playing both sides. That’s staying constant with the belief that Winx is in very good hands and we all should be grateful for the longevity that care has brought to Winx’s career and the integral part it has played in such an uplifting story which has enthralled us all. An audience of 42 000 people will fill Randwick to capacity on Saturday (the house full signs went up on Wednesday) but this moment will not be just for racing enthusiasts. Anybody who can find the time should tune in on Saturday from about 2.40pm to watch Winx in action one more time. The emotion will be as supercharged the action and it comes with the guarantee that you will be watching something very special.